may be difficult for those with limited mobility. Sitting on the sofa with a cool glass of beer or wine, watching the sun set over the sea (April - October), is our favourite place to be. 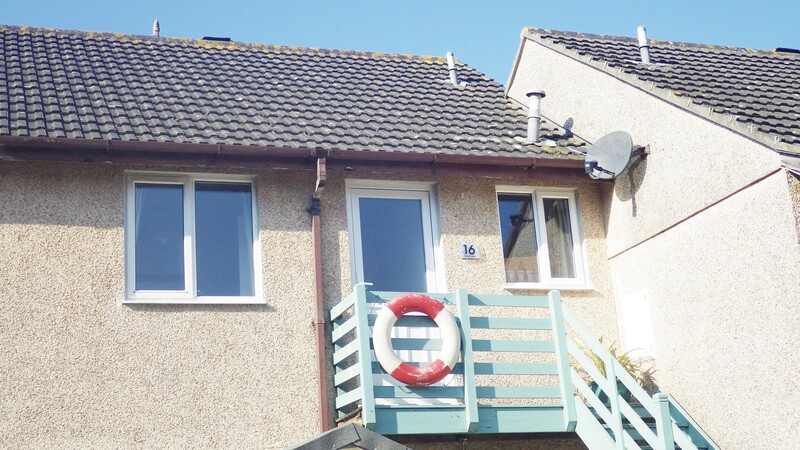 The living area overlooks beautiful Porthtowan beach and offers a comfy sofa with snuggly throws, beanbags for lounging, flatscreen TV, DVD player with DVD collection, a lovely round glass dining table, books and family games. Unlimited Wifi is available throughout the apartment. We always have the best night's sleep when we stay here. 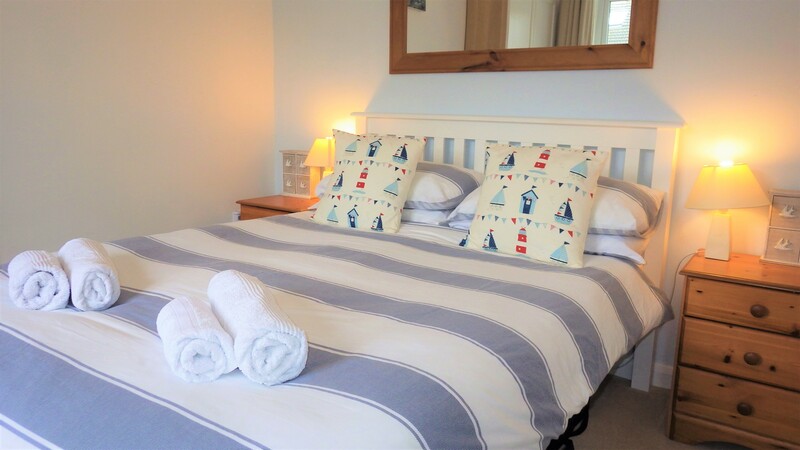 The cosy double room has a lovely comfy bed with a new matress, stylish seashell decor, wardrobe, bedside cabinets with draws and reading lamps and a hairdryer. The small twin room has bunkbeds with individual reading lights and underbed storage. An iron and ironing board are also available. The open plan kitchen is just the right size, with plenty of work space but everything handy to prepare a yummy meal. 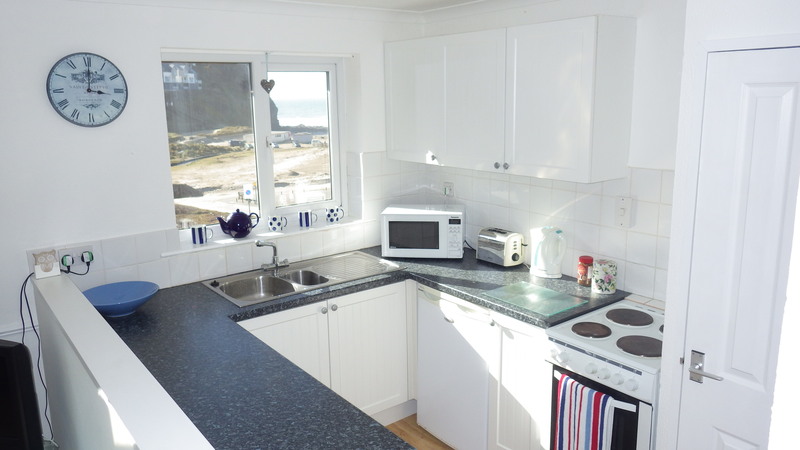 It is well equipped with a microwave, under counter fridge with small freezer compartment, electric oven and hob, washing machine, tumble dryer and plenty of space for groceries, and also overlooks the beach. 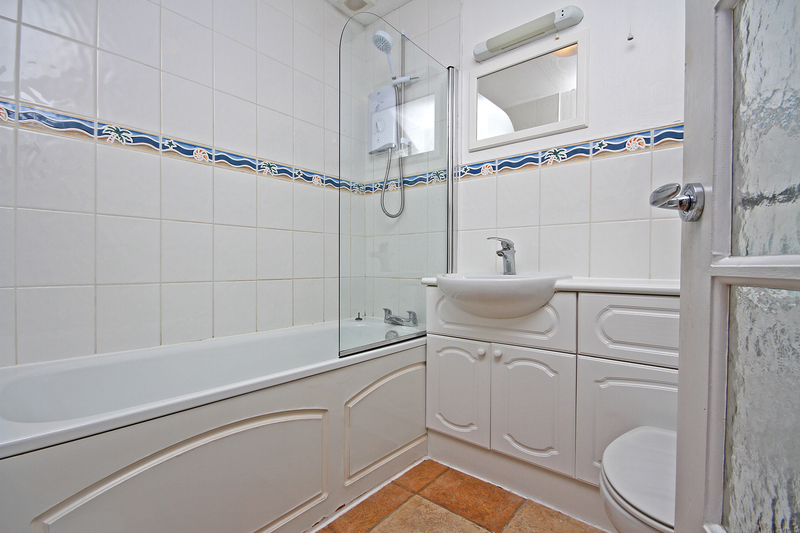 The white tiled modern bathroom has a Mira over-bath electric shower. We understand that you want your holiday to be as easy as possible, which is why bed linen and towels (not beach towels), tea towels, washing up cloths and electricity are all included (no coin/key meter). We also like to provide all the basics (washing up liquid, condiments, handwash) to get you started, along with tea, coffee, milk and a little something nice to greet you on your arrival. We are very family friendly and often have children to stay (including our own of course!). Family games, toys, socket covers, travel cot (please bring your own cot bedding), changing mat and highchair all make life easier for parents. You can park directly outside Seashells in our dedicated parking space. There are also a few shared spaces available on a first come first served basis if you have a second car. Unfortuately our leasehold agreement does not allow us to take dogs or other pets. 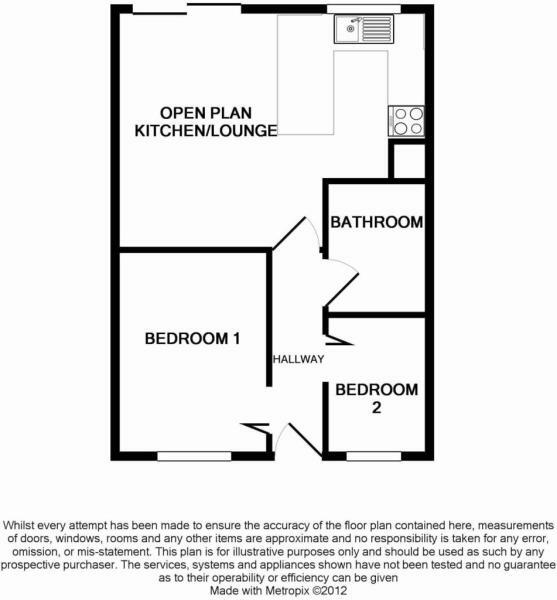 Unfortunately the apartment may be difficult for wheelchair users or those with mobility issues due to its first floor location and small size. You can read our accessibility statement here. Outdoor rinsing facilities available for wetsuits and sandy feet! If you have any questions about our holiday home or what's provided, please don't hesitate to get in contact.